Bundesliga | Borussia Dortmund’s Signal Iduna Park expansion: Germany’s biggest stadium set to get bigger! Borussia Dortmund’s Signal Iduna Park expansion: Germany’s biggest stadium set to get bigger! 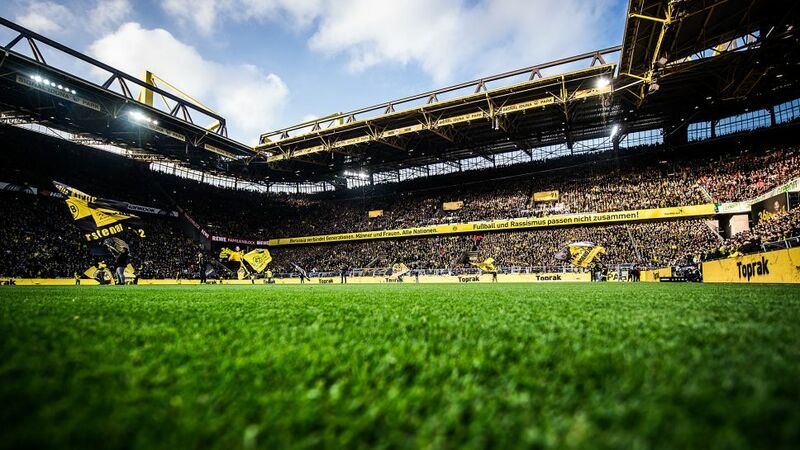 They may boast the highest average attendance ever recorded in European club football, but Borussia Dortmund are set to add yet more seats to the Signal Iduna Park for the 2018/19 season. Die Schwarzgelben became the first club ever to record an average attendance of over 81,000 fans in 2015/16, but the club have announced that next season the capacity will climb from its current 81,360 to 81,365. * #Infotweet: Due to renovation work on the Signal Iduna park, there will be new capacities for the 2018/19 season. National: 81,365; International: 66,099. A gain of five seats may seem marginal, but BVB have 50,000 people on their season ticket waiting list, so every little helps. The Signal Iduna Park will also sit 248 more spectators for UEFA Champions League evenings. Bundesliga games will see the full capacity being used, with 66,099 now allowed for European competition. Watch: Enjoy a guided tour of Dortmund's famous Signal Iduna Park! BVB have been playing at the Signal Iduna Park, formerly known as the Westfalenstadion, since 1974. During that time, the ground has played host to numerous major sporting events, including six games at the 2006 FIFA World Cup.